Our previous post showed how various allocation decisions impact a two-asset portfolio. We started with two assets – equities and bonds – because it forms the foundation on which most allocation plans are built. However, the true impact of diversification is felt when you have uncorrelated assets in the portfolio. Here, we expand on the post by adding a third asset. Given how strongly the S&P 500 (the SPY ETF) and the Nasdaq 100 (the QQQ ETF) are correlated, there is no point in adding both. We’ll go with the QQQ because it has an Indian analogue in the N100 ETF. 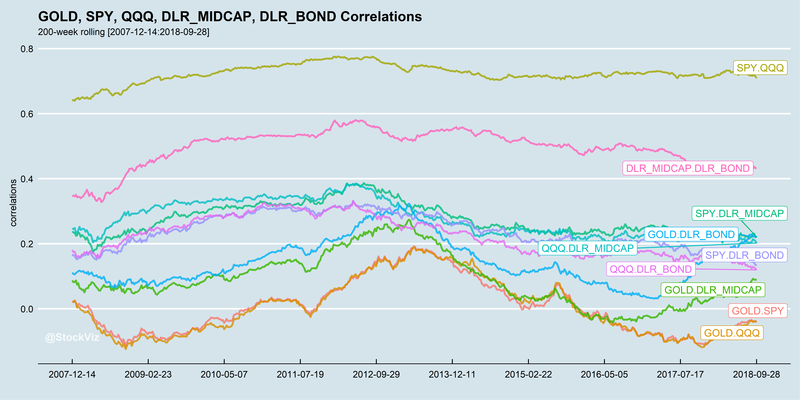 Also, note how the SPY and QQQ are uncorrelated to the dollar adjusted MIDCAP and 0-5yr TRI indices. 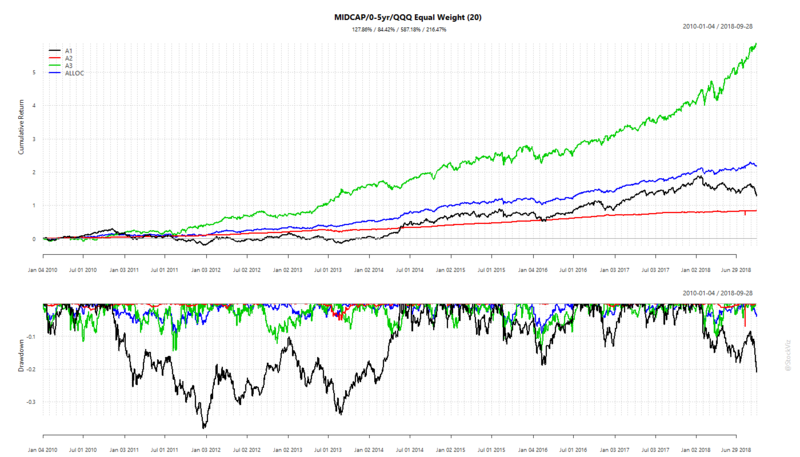 And finally, observe the light correlation between the MIDCAP and 0-5yr TRI indices. So, to keep things simple, we will go with the MIDCAP 100 index, the 0-5yr TRI and the QQQ ETF (prices converted to INR) as the three assets that form our portfolio. 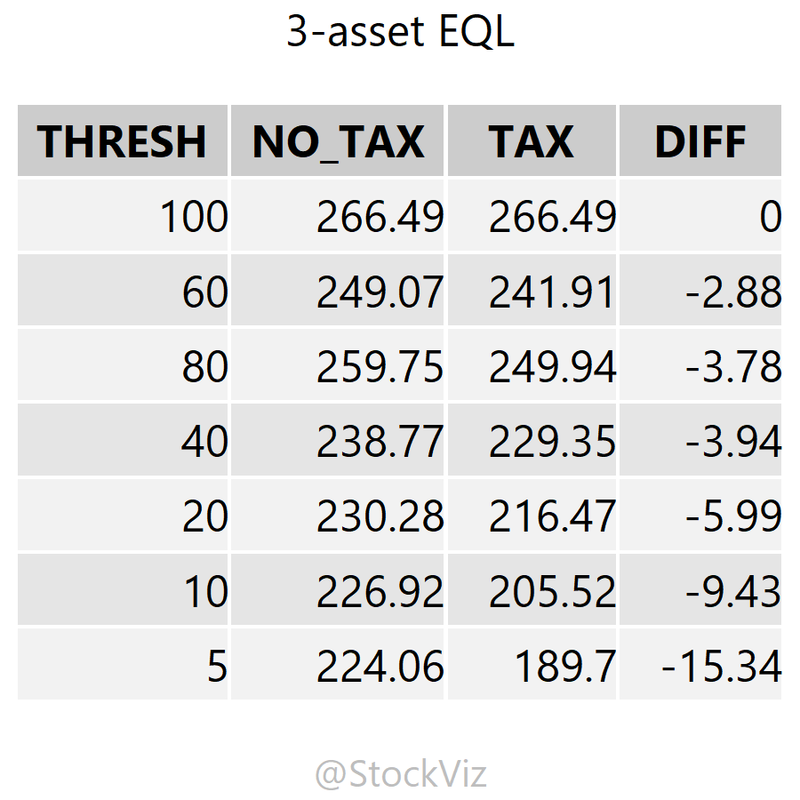 And to get things started, we’ll keep an equal weight on all these three assets in the portfolio. The toggles that remain are the rebalance thresholds and tax impact. Here, we will use the same iterations that we employed in our two-asset portfolio example. In the cumulative return and drawdown chart below, A1 is the MIDCAP index, A2 is the 0-5yr bond index and A3 is the QQQ. A tax drag of 10% and an STT of 0.1% is applied at every rebalance. The rebalance threshold is set at 20%. The blue line is the resulting equal weight 3-asset portfolio returns. Lower risk: The equal-weight portfolio draws-down less than the MIDCAP index. Needs discipline: The difference in returns between the MIDCAP index and the equal-weight portfolio can often be very large. Keeping still is a virtue. Tax-impact: The equal-weight portfolio has a tax and transaction cost angle that a MIDCAP buy-and-hold strategy doesn’t. Capital gains on international equities, bonds and domestic equities are all treated differently. Asset allocation is about delivering better risk-adjusted returns through diversification. Side note: setting the rebalance threshold is a trade-off between holding onto trending assets (potentially more profits) vs. booking profits and buying a lower-return asset (FOMO and tax incidence.) There is a wide range of theories on this topic. For now, we will restrict ourselves to just running through different scenarios.